Create a new project and select a device. 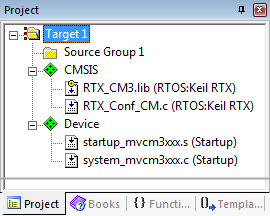 Finally, configure RTX to the application's needs using the RTX_Conf_CM.c file. * definition the objects are defined as external symbols. This header file defines all objects when included in a C/C++ source file. When #define osObjectsExternal is present before the header file, the objects are defined as external symbols. A single consistent header file can therefore be used throughout the whole project. IRQ interrupts are never disabled by RTX Kernel for Armv7-M architectures (Cortex-M3/M4/M7). Software interrupt 0 is used by RTX and cannot be used in an application. RTX uses its own SVC Handler which is automatically linked from the library. SVC Functions explains how to use a custom SVC table. When interrupt priority grouping is used, the PRIGROUP must be set before the osKernelInitialize() function is called (usually in the SystemInit() function in the system_device.c file). The kernel reads the value of PRIGROUP to correctly set internal interrupt pre-emption priorities. Allowed values for PRIGROUP are from 0 to 6. The PRIGROUP value 7 will cause RTX to fail. 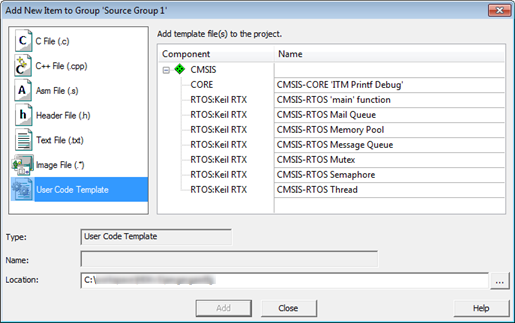 The lowest two pre-emption priorities are reserved for RTX kernel, all remaining pre-emption priorities are available to be used in an application. Do not change the priority used by the RTX kernel. If this cannot be avoided, ensure that the preempt priority of SysTick/PendSV is lower than SVC. 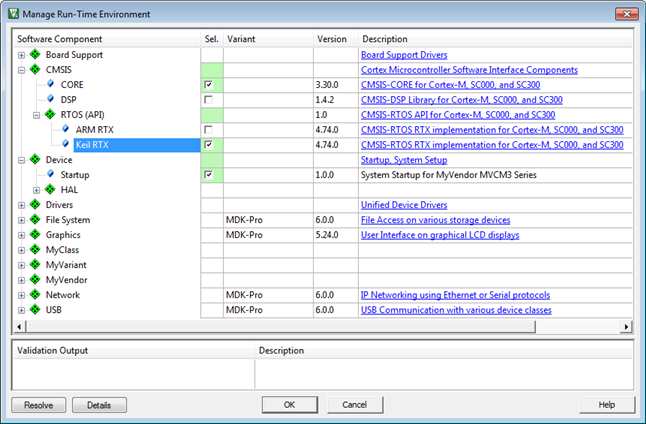 Check the main stack size configured from the device startup file if you see sporadic crashes of your application. Supervisor Calls (SVCs) are used when calling RTX functions from Thread mode. All SVC calls use the main stack.